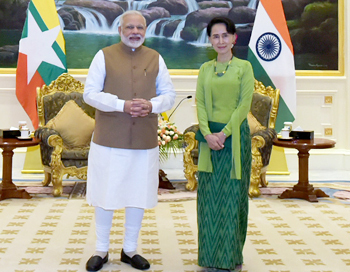 PM Modi said, "India's democratic experience is relevant to Myanmar. As neighbours, our interests are similar in the area of security. It's necessary for us to work together towards the security of our land and maritime border. Myanmar and India, being neighbours, our outlook and focus on security are similar. 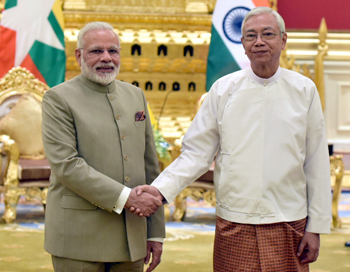 It is necessary that India and Myanmar cooperate to ensure that the land and coastal borders we share remain calm". State Councillor Suu Kyi responded by saying, "There are many areas in which we can cooperate. I would like to talk about the role India has played in capacity building because that is what our country is more in need of - to build up the capacity of our people that we may be able to construct truly safe and lasting federal democratic unions. India has always been eager to join us in our efforts, to strengthen our democratic institutions of our country and for this also... the respective fathers of our Independence movement were close to each other and I think this closeness has been maintained throughout the seven decades and we truly believe that this will continue to be maintained in the years to come."